Investing in G-secs becomes simpler: should you buy? Last month, online broking firm Zerodha enabled a digital platform for retail investors to buy government securities (G-secs) with a minimum investment of ₹ 10,000. NSE India too launched NSE goBID last week which is an aggregator for buying and selling G-secs online and via an app for retail investors. Though the Reserve Bank of India introduced the non-competitive segment in G-secs back in 2001 to enable retail investor participation and this was extended to treasury bills in 2016, but the segment hasn’t really gained popularity. Facilities offered by banks like IDBI Bank Ltd and Axis Bank Ltd also failed to kindle widespread interest from retail investors. With the new easy access platforms now available, will demand for G-secs from retail savers go up? These are bonds, both short- and long- term, issued by the government of India to raise funds for their expenditure. The government pays a specified coupon or interest rate on these bonds that may be payable annually or semi-annually or for any other specified frequency. The securities which have a tenure less than a year are called treasury bills and the ones which mature after a year are called bonds. Retail investment in corporate bonds is not a new concept, but G-secs have been largely perceived as inaccessible for retail investors. This is because the process for buying these bonds was not simple. Most participants are institutional buyers with very large-sized bids which are unsuitable for retail demand. In 2017, RBI notified that stock exchanges could act as aggregators for non-competitive bidding for retail investors to access G-secs. Even as the process is now getting simpler, awareness remains an issue. Admittedly, bond investing is not an easy concept to grasp. Firstly, you must make a bid, which can sound daunting, but it just means applying for the bond and put the face value as your bid price, which is similar to investing in an equity initial offer. “Investors will be allotted the bonds bid for at the weighted average price/yield of the successful bids in the competitive auction, which, is usually close to the face value. Plus, one should know that the interest rate coupon changes with each launch. These details are often hard to grasp for the average retail investor," said Dhiraj Relli, managing director and chief executive officer, HDFC Securities Ltd.
You will also come across term yield, which may confuse you. If all you are looking for is safety and regular income, then ignore the term yield. Just look at the bond’s coupon or interest rate, which is what you will get annually and hold the bond till it matures. At maturity, you will get the face value you paid and any remaining interest payout. The other difficulty is exiting before the bond matures. What if you need the money now? Technically, you can sell the bond in the secondary market or via stock exchanges just like you sell shares. However, there is very little demand for these bonds and there may be no buyers when you plan to sell. Zerodha has said it will act as the market maker and buy bonds which investors want to sell in the secondary market. “To begin with, we are providing investors a way out before maturity if they need to sell. It is important to do this as right now it’s a nascent market and to build it up we will need to be market makers till substantial retail volume picks up," said Nithin Kamath, CEO, Zerodha, while speaking with Mint a few days after they began offering this facility online. Then, you can’t pledge G-secs for taking a loan. “Along with lack of liquidity in the secondary market (and hence no easy premature exit), there is no provision for pledging or taking a loan against these securities," said Relli. While these hiccups may cause discomfort, G-secs are ideal for long-term allocation. “For the average retail or even HNI investor, these bonds make for a good long-term investment; fixed deposits cater to 3-5 years tenure but for anything more than that the choice is limited and long-term G-secs (available up to 40 years maturity) could fill that gap. We have suggested to exchanges the possibility of having separate tranches launched specifically for retail investors and provide effective secondary market for these instruments," said Relli. The bonds are issued by the government, making them the safest investment if you are concerned about losing your money. Current returns are also better than fixed deposits (see graph). If you are comfortable investing in National Savings Certificates (NSC) or Public Provident Fund (PPF), then investing in G-secs should not be a concern. 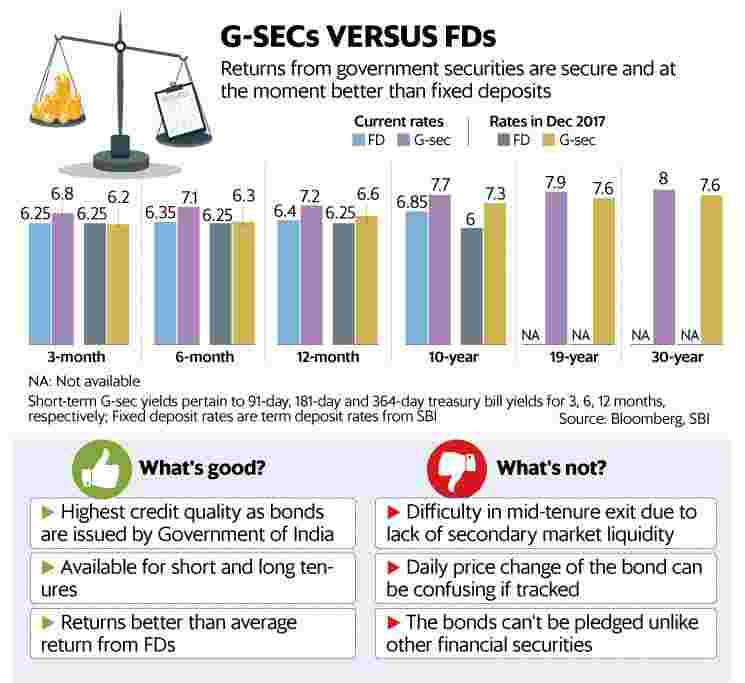 “G-sec yields are now better than what FDs are offering and for retail investors looking for safety, government issued bonds are the most secure. We are also incentivising brokers to popularise this form of debt investment among retail investors," said K. Hari, chief business officer, NSE. Short-term rates for G-secs can fluctuate, but the benefit may be more visible when you consider locking into long-term, 10- 30-year G-secs. Another benefit of investing in G-secs is they offer various investing tenures. You can invest for your short-term, 3-6-month requirement in 91-day or 181-day treasury bills or you can choose the 10-year G-sec for your long-term debt allocation. Lastly, it’s a low-cost affair. Zerodha charges ₹ 6 per ₹ 10,000 trade and NSE doesn’t charge anything. You will have to, however, pay for the demat charges. On both Zerodha and NSE platforms, the registration process is simple and can be done online if you have a demat account. Once bought, the bonds will be stored in your demat account. For the NSE goBID platform, you must choose your broker with whom you are registered to facilitate this transaction. Your personal details and PAN number will also be required. The mutual fund route: You can also use G-sec funds, known as gilt funds. There are long- and short-term gilt funds and those which invest in 10-year G-secs only. While investing through the MF route gives you better liquidity if you are unsure about the tenure, the fund can invest in a collection of G-secs with varying maturities. For example, a long-term G-sec will be able to invest in 10-year and 30-year G-secs. Since MFs have to declare the price or NAV every day, you may find a lot of fluctuation in daily value. While this may not impact your long-term return, it can make you anxious in the interim. Cost-wise too the direct option works better. While your medium-term—5-8 years—debt allocation may be better served by other small savings schemes, G-secs are a god option for long-term allocation of 10 years and more. Whether you pick a fund or choose to go direct, investing in G-secs for your debt allocation is now an option that you can consider seriously.